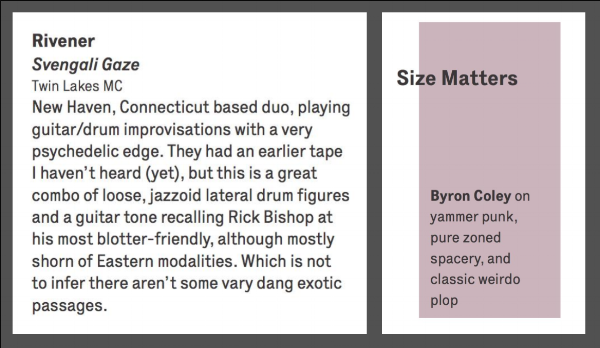 New Haven-based duo Rivener’s lysergic improvisations are shape-shifting explorations of no wave, noise, free-jazz and psych with some elements loosely rooted in the rock tradition--ineffable expressions of the human spirit. Intrepid seekers always listening for the signs, guitarist/percussionist Paul Belbusti (Mercy Choir) and drummer Michael Kiefer (Myty Konkeror/No Line North) mangle, stretch, bend, and breathe new meaning into these influences with subtle dynamic shifts, conjuring stormy, cosmic clouds of sound. This is the true freedom rock...so turn it up, man! "a highly communicative and wholly satisfying eponymous effort...a fresh chapter to the free-rock book." Svengali Gaze reviewed by Terrascope, March 2017. Svengali Gaze reviewed by The Metal Dad, November 2016. 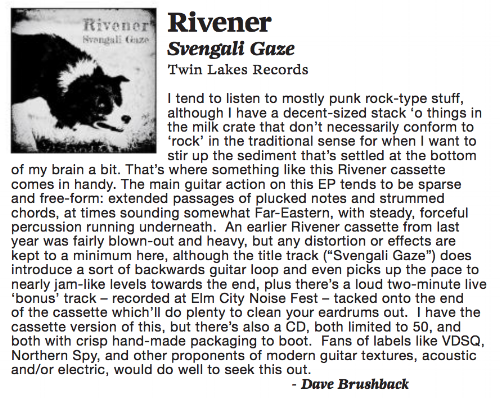 Rivener's Svengali Gaze included in Avant Music News' Picks of the Week, November 2016.